It’s been about two weeks since I came home from my trip to the U.K. and I miss it terribly. I never realized that I could miss a place – the sights, the sounds, the food. Everything was like a dream. I tried very hard to take London back with me. (Unfortunately, it wouldn’t fit in my suitcase!) So I settled for some lovely souvenirs (pictured below). I wanted to buy even more, but the fear of running out of money for food slowed me down. 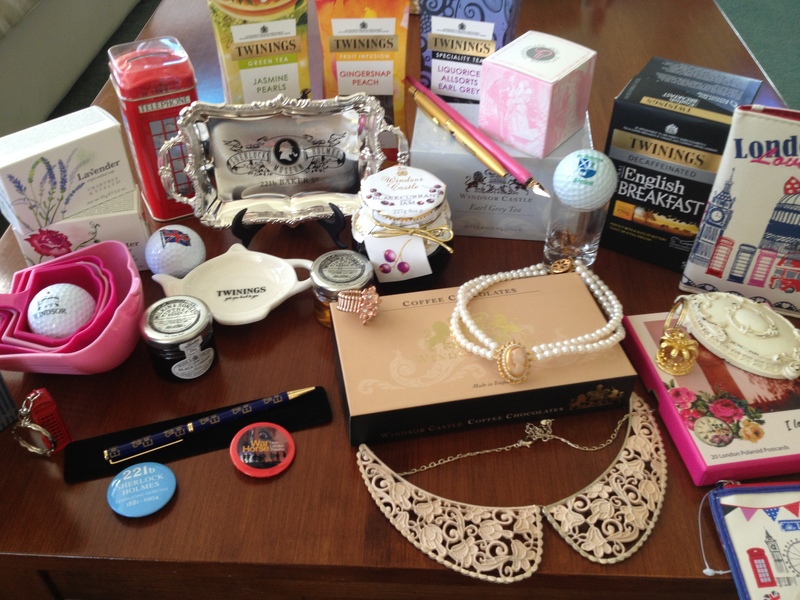 I’m a bit embarrassed to admit that I ended up with six (yes, six) boxes of tea, most of which were from Twinings, but other than that I’m quite happy with my purchases. Here’s the grand total: three jars of blackcurrant jam, two necklaces, a shot glass, key chain, and a box of chocolates from Windsor Castle, a small mirror, a decorative plate and pen from the Sherlock Holmes Museum, a new “London Love” passport case and change purse, cupcake shaped measuring cups, two buttons, a pink fountain pen with matching pink ink, a dozen or so postcards, and a program from each show that we saw. I also came home with a huge stack of U.K. magazines for some friends; golf balls and candy for my dad; scented soap, a key chain, pen, and a candy bar for my grandmother; and a teabag dish and some tea for my mom. It’s amazing that I was able to carry it all back with me! Postcard collage decorating my desk at school. 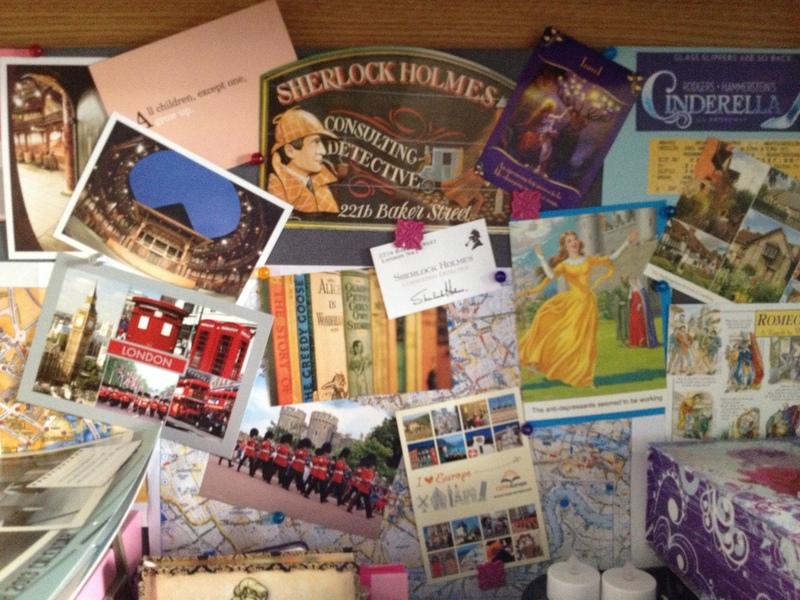 Sometimes when I’m sitting at my desk doing schoolwork, I’ll gaze up at the postcards and daydream about London. Even my beloved New York City can’t get London out of my mind – it’s just not the same. I know I will return again someday, I just need to be patient. This concludes my London Blog, but I enjoyed writing it so much that I’m not quite ready to stop blogging. So, I’ll continue to blog about my next chapter: the last semester of my senior year of college. It’s really an exciting time and I look forward to sharing it with you! Stay tuned for my next post all about my first week interning at Parenting.com in New York City!